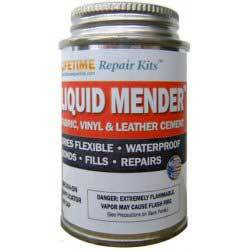 Liquid Mender repairs rips, tears, cuts in nearly any material. Specially formulated for creating invisible, waterproof repairs in fabric, leather and vinyl. Works great on canvas, nylon, vinyl moulding, and more. Permanent and flexible bond. 4 oz. container with application brush built into the cap.